The buckle backboard Straps has an open loop on each end and fastens securely to backboard frame simply by threading strap section through open loop. Each strap includes two straps, one for each side of the board. This economical backboard strap features a loop-through system to attach to hand holds, and an extra-long 35" length. 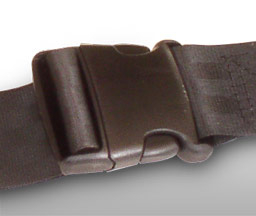 Straps are sold as an individual set. Each set consists of a strap for the left and a strap for the right side of the board. (Most boards require 3 or 4 sets to outfit the board).